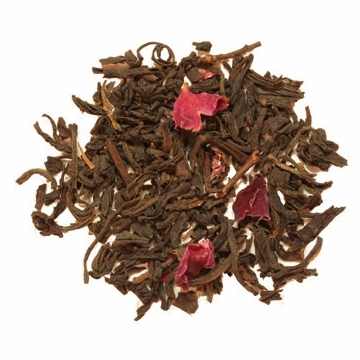 Rose Black Tea is made from fine black tea mixed with crushed rose petals. When brewed this tea produces a reddish brown liquid with a sweet malt taste and a refreshing floral aroma. This is a superior black tea for all occasions. Free shipping with purchase over $60. 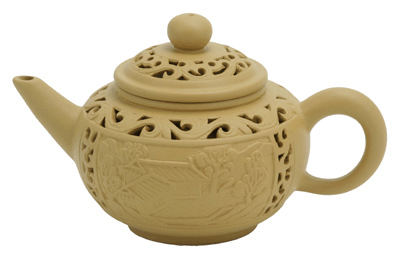 Finally, a good China rose tea! I have been trying for years to find a rose tea similar to the Rose Pouchong that I was able to buy when I lived in London, UK. This is it! After all these years, thank you for this lovely fragrant simple black rose-scented tea. Rich flavor with a wonderful aroma. This is our favorite breakfast tea. This is our favorite breakfast tea. The rose petal flavour is refreshing and compliments fruity breakfast foods. Nicely blended to allow the flavours to harmonise and give a refreshing brew. The floral flavor and smell of roses enhances this black tea. I drink 2 - 3 cups of this tea while at work. This is an excellent tea for everyday drinking, I become relaxed and better focused on work details after having a cup. This tea seems to go well with a large variety of meals. I recommend it to all my friends that drink tea or coffee. This tea is really balanced. The Black tea is smooth and not at all bitter. And the rose is definitely out front but not at all overpowering. Great Iced as well as hot. A perfect winter or summer tea! My wife loved the tea. "The black tea is smooth and the rose flavor is pronounced". Genuinely one of my favorite teas ever. Buy some. Do it now. Great flavored tea with a nice bouquet! This has been my only morning tea for the past several months--it replaced my lychee black. It is a real treat. This tea is very refreshing plus rose accent gives you wonderful taste. I'm not usually a fan of "floral" flavored teas, but this one surprised me. I've found it makes a great iced tea. I just tried this one to try to find a nice middle of the road tea that I could drink hot or iced. I like it both ways but I will say that I prefer it iced. It has a nice crisp refreshing taste with just a hint of floral. It goes really well iced with mint leaves. I will order this one again. couldn't stop drinking it. the smell is so good as well as the taste. this is my current number 1 black tea choice unseating earl grey for the top spot. Love this tea. Got the sample fell in love and just had to buy a big bag of it! I love this tea it is so good . the first time I bought it I got the one pound bag. yeah oh my it took me two years to drink that tea up so this time I reordered got the 8 oz size . I think its a better size to manage. still probably should have gotten the huge one pounder . im sure I will reorder this tea often. Now this is FULL Flavor! Very rich. Not my daily cup of tea, but when in the mood, it's on point. Hands down my favorite! It's like a warm blanket and a gentle hug on a cold winter night. The smell is wonderful, and the taste is a bit of heaven....the best! Even more delicious than I tought! I had trouble finding rose black tea without aromas in it and decided to try this one (also my first experience with enjoyintea.com). It's awesomet! It is very fragrant and the taste balance is perfect! It is everything I hoped and even more! I absolutely love the flavor. The best flavor I've had for a black tea in a long time, I got out of the oolongs and the darjeelings and WOW. even when cool this teas has the lovely after flavor of a mild but robust black tea. no bitterness. I've been drinking Harrod's rose tea and petals for years and can no longer find it. After reading a review I decided to give this a try. It's very close in taste and I love it. I typically mix with English breakfast tea so the flavor is a little milder that way. Very fresh and high quality. This is the best rose black tea I can remember having. The dry tea has a lovely rose bouquet. It brews to a rich dark tea that is not overpoweringly flowery and resists getting bitter. I mix in some young puerh which adds a touch of earthiness for a perfect cup of morning tea. This is the most flavorful tea! I love the scent! This is a lovely rose black tea with the flower bouquet and flavor you would expect. I especially like it with a pu'erh tea mixed in. The pu'erh by itself is too earthy for my taste, but a little mixed in to this rose tea seems to deepen and enhance the flavor. 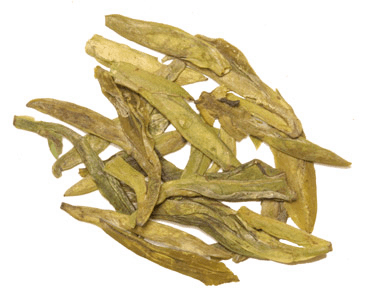 I received a sample of this tea with my last order, and I brewed a small pot of it today.It has a very nice flavor and a lovely aroma. A Real Treat... Winter or Summer! We love tea and generally I'm not into floral teas, but Rose Black is the exception! It is fantastic "hot tea" -- even without sugar it is a treat! As a sweetened ice tea it is wonderful, cooling and exotic. It is the tea my guests choose first both summer and winter. I highly recommend Rose Black Tea and the green teas from EnjoyingTea.com. They have great products and they stand behind them. I recommend EnjoyingTea.com and their teas often. I am a huge fan of floral teas. I picked this tea out as a free sample and boy, am I glad I did! The tea is naturally sweet, delicate and not too strong. I drank my first cup last night and it was so relaxing to have after a long stressful day. I will definitely buy this again. I got a sample of this and I think it's wonderful. The black tea itself is great, and the rose petals added in make it all the lovelier. Not my thing, but she would give it five stars. I fell in love with rose black tea from Republic of Tea, but they sell it only January to March. I've been in search of another source of a sweet, rose flavored tea, and finally found it! I like my tea very sweet with cream, and when made this way, the flavor literally stays with me and makes me feel happy inside for hours later! The tea is not bitter at all, not harsh. My roommate says it's so sweet it doesn't need sugar. There have been times I've accidentally left it brewing, and a quick zap in the microwave brings it back to fresh. I'm not much of a tea drinker, so I'm very particular about my tea -- most of them I just don't like. This tea is absolutely my favorite! In all, a great floral tea!